Born just twenty years after the end of slavery and orphaned at the age of five, Lucy Diggs Slowe (1885–1937) became a seventeen-time tennis champion and the first African American woman to win a major sports title, a founder of the Alpha Kappa Alpha sorority, and the first Dean of Women at Howard University. She provided leadership and service in a wide range of organizations concerned with improving the conditions of women, African Americans, and other disadvantaged groups and also participated in peace activism. Among her many accomplishments, she created the first junior high school for black students in Washington, DC. 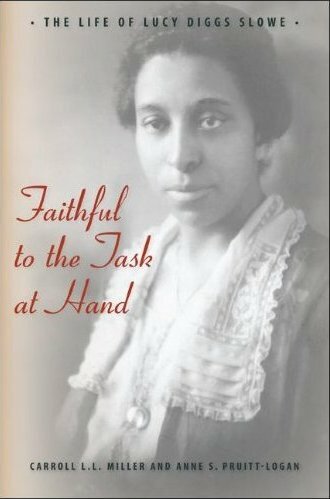 In this long overdue biography, Carroll L. L. Miller and Anne S. Pruitt-Logan tell the remarkable story of Slowe’s steadfast determination working her way through college, earning respect as a teacher and dean, and standing up to Howard’s President and Board of Trustees in insisting on equal treatment of women. Along the way, the authors weave together recurring themes in African American history: the impact of racism, the importance of education, the role of sports, and gender equality.